Kleber didn’t show up for practice on Thursday morning. “My bad, I didn’t know it was on” was his excuse, promising to train double shifts the following day. Seen in a VIP area of a music club in São Paulo until the wee hours the previous night, Kleber was severely criticised in the social medias and turned into a laughing stock. Palmeiras’ directors were less amused and slapped the player with a 10% salary deduction. We are soon to find out if this was an isolated event or not; let’s hope it’s the last, dying breath of this spectacle. Until now, construction on the former Parque Antárctica grounds – where Palmeiras’ Palestra Itália Stadium was located – has been focusing entirely on the administrative buildings. However, today at 2pm the heavy machines got busy as the setting of the first pole of the New Arena was broadcasted live on the hotsite. 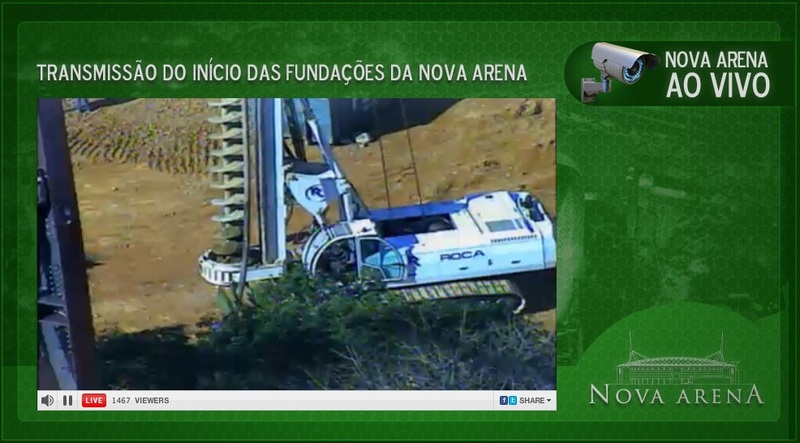 While everything else in Brazil is retarded (in terms of schedule) and a waste of tax payers’ money, the New Arena is ahead of schedule and 100% privately financed. It’s a source of pride already today; imagine when it stands completed! We’ve had a couple of busy weeks and the activity continues as we go into the last week before the transfer window shuts tight. Palmeiras have released the young striker Max “Pardalsinho” Santos to sign a one-year contract for Goiás. Good luck to him in the second division; hopefully he’ll get more opportunities to evolve there and at Goiás than he had at Palmeiras. For a change, a couple of players seem only moments away from arriving at Palmeiras: we have the 20-year-old left winger Gerley, elected the best left winger in the last edition of the Rio Grande do Sul state championship, coming with a price tag of a modest US$ 625.000. Apparently, the documents have already been signed and Caxias, Gerley’s current club, is only awaiting the deposit of the sum into their bank account. 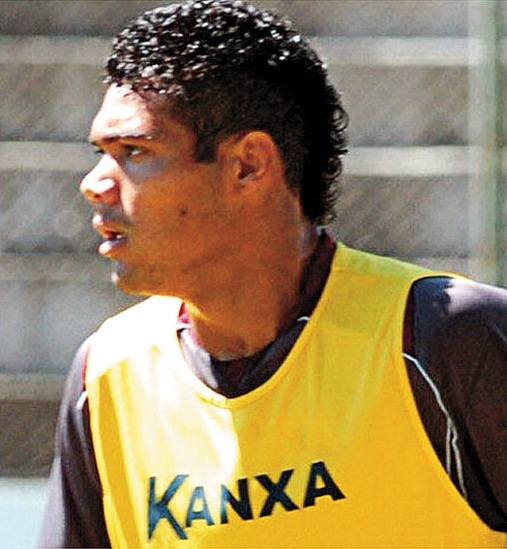 In addition, and literally at any minute now, Palmeiras might announce the return of Barcelona centre back Henrique. All parties are agreed and Barcelona have authorised the player to sign a seasonal contract with the club he successfully defended during five months in 2008. Henrique is undergoing medical exams as these lines are being written and is then expected puting pen to paper. He comes to replace Danilo – who left for Udinese/ITA in early June – and will hopefully form this Brasileirão‘s most solid centre lock together with Thiago Heleno. Welcome, Gerley! Welcome back, “sheriff” Henrique! Also, a loud and clear WELL DONE do messieurs Tirone and Frizzo! Then there’s Martinuccio. The Argentine is currently in Europe, obtaining his Italian passport. The player has attracted some attention from both Brazilian as European clubs (for example Roma), but has signed a pre-agreement with Palmeiras that apparently is very solid. As previously uncovered here at Anything Palmeiras: unless someone is ready to pay up a little over US$ 30 million, Martinuccio plays for Palmeiras the coming three years. If everything goes as planned, he pulls on the Palmeiras jersey first week of August. This Sunday, Palmeiras vs. Flamengo would have been the main event. Due to Brazil progressing to the quarter-finals in the America Cup (and TV Globo not wanting to lose out on transmission profits from any of the two games), the Palmeiras game has been postponed to Wednesday 20th, time to be confirmed. Bad news for anyone who lives outside of São Paulo and can’t make it during the week. Bad news for many of those living in São Paulo but working until late in the afternoon (as there is a risk that the game be played at 7:30pm instead of 9:45pm) or need to get up very early the next day. The Brazilian Football Federation is messing with the schedule, postponing games due to request from teams – like Santos – that have many players in the national squad… Why not just pause the whole Brasileirão for a few weeks while the Copa América is on so that we can avoid all this hassle? No, wait, that would include some actual PLANNING; not CBF’s strong side, if you know what I mean.